Glee 2x11 "The Sue Sylvester Shuffle"
You know, I remember a time last season when this show had a very similar plot about the football players doing a dance number. Remember? Single Ladies? In fact, lots of the storylines on this show are the same week after week. The glee club gets slushies, the football team calls them losers, Karofsky's a homophobe, Sue is a dictator who will do anything to elevate the Cheerios. Blah blah blah, heard it all before! In any event, this week's episode was about the championships for both the football team and the cheerios. The football team was in disarray because half of them look down on the other half for being in glee. Will and Beiste decide to band together to try to bridge the rift by getting the football team to try out glee for a week. Things go bad (fights! ), then good (they agree to do a halftime show), then bad again after the hockey team (complete with mullets) slushies the football team. They get a taste of their own medicine, and immediately decide to quit, which means they won't be able to play in the big game. Meanwhile, Sue has gone overboard with the cheerios nationals number, buying a cannon to make things bigger and more insane. She also gets the board to set the championship during the same time as the football game, thus forcing Quinn, Brittany and Santana to choose between the two. They choose the cheerios, because they don't want to be losers or whatever. Loserdom was the theme of the evening, clearly. 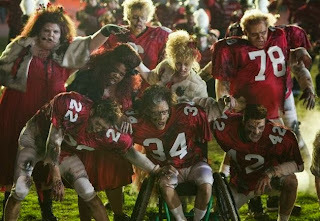 Rather than just let the guys forfeit the football game, the ladies of glee step up to join the football team. Only once they start getting trounced and Tina almost gets seriously hurt, Finn decides they've got to fix things. He takes off to get the cheerleaders back, and Puck manages to rouse the other guys to come back and do the halftime show they had planned. 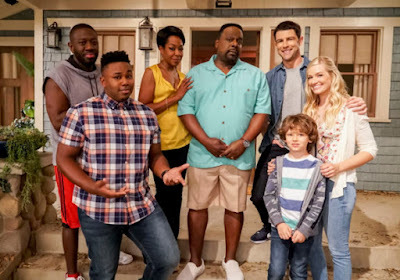 The show goes off great, and they are able to bring it back together and win the game in the end. All is well, right? Well, not so much. Because though Karofsky had a great time singing and dancing, that doesn't mean he's going to permanently join glee. Surprised? Not me. Sue ended up losing what would have been her 7th consecutive cheerleading national championship without Quinn, Brittany and Santana, and is faced with the terrible truth that her extra funding will now be going to the glee club. Quinn seemed to suddenly be more into Finn than she has been, ever, this week when he stepped up and got in her face about not choosing glee over the cheerios. She even kissed him at the end of the episode. I guess she and Sam are not going to work out? I have to say my favorite part of the whole episode was, after Sue was going on her rampage, Will was in the locker room with Beiste and telling her about it, then Sue comes in and continues the rampage in there too. That made me laugh out loud. I will also say that I thought the music numbers this week were all pretty great. If I had to pick a favorite, it would have to go to the Warblers' rendition of Bills, Bills, Bills. Enough from me - what did you think?